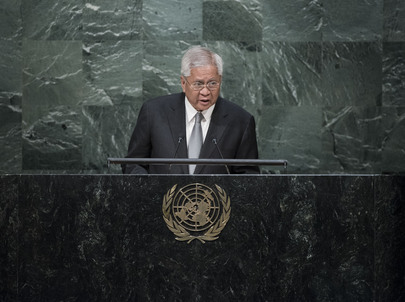 03 October 2015 – Philippine Foreign Affairs Secretary Albert F. del Rosario urged the United Nations and the international community to continue supporting the peaceful resolution of maritime disputes in the West Philippine Sea. Secretary Del Rosario joined other Foreign Ministers of the Association of Southeast Asian Nations (ASEAN) in a meeting with UN Secretary-General Ban Ki-moon and 70th UN General Assembly President Mogen Lykketoft. “With the growing support from the international community in peacefully resolving disputes in the South China Sea/West Philippine Sea, including through arbitration, the Philippines is hopeful that the final outcome of the arbitration process would pave the way for a settlement of maritime disputes,” Secretary del Rosario said. He also reiterated the Philippines’ call on the UN and the community of responsible nations to support the full and effective implementation of the Declaration on the Conduct of Parties in the South China Sea in its entirety, and the expeditious conclusion of a binding Code of Conduct. For his part, UN Secretary-General Ban Ki-Moon said his meeting with ASEAN Foreign Ministers took place at a “critical time in world history” when the World Body turns 70 years old, global leaders have just adopted the 2030 Agenda for Sustainable Development, and ASEAN to introduce the ASEAN Community Vision 2025. He expressed support for the implementation of the ASEAN Community’s post-2015 vision alongside the 2030 Agenda. “These agendas are complementary and share common goals,” the Secretary-General said. “ASEAN should have a stronger ownership of the Sustainable Development Goals,” he added. The ASEAN Foreign Ministers also met separately with U.S. Secretary of State John Kerry on 30 September. He emphasized that the US is a Pacific nation and that more and more Americans are becoming committed to the ASEAN-US partnership than ever. UN Secretary-Genera Ban Ki-moon (left photo, middle) and US Secretary of State John Kerry (right photo, middle) separately met with the Foreign Ministers of the Association of Southeast Asian Nations (ASEAN) in New York. “The future of ASEAN and the US are intertwined and the US will continue to support the ASEAN Community, especially through the ASEAN Economic Community, in order to sustain the prosperity of the region,” Secretary Kerry said. Secretary Kerry also expressed support for ASEAN Member States that work hard to protect peace, security and stability in the South China Sea.